Remember: There are still some great giveaways active on the upper right hand side of the page! I have had penpals since elementary school. There was an exchange program in my school, and it was one of the best things that ever happened to me. I picked up a few more along the way and we all refuse to succumb to the temptations of going digital. We like 'real' letters'. We look forward to receiving something other than a bill in the mail. We write often. And because I have multiple pen pals, I end up with wrist pain by the time I'm done. (In all fairness, long periods of time with my mouse can tend to cause similar pain!). I am a stationery addict and can easily and readily find pretty papers to work with and add to my ever growing collection, but what I hadn't been able to find in all these years is the right pen. 'The' pen, you know the one, the one you won't let anyone else in the house use; the one you would never dream of lending to your co-workers. . . Until now that is! I have finally found that pen I refuse to share. And it makes my marathon letter writing sessions go that much smoother. I can write now for long periods of time pain free, and that to me is absolutely priceless! It's called the UGLee Pen. A not so pretty name for an ergonomic pen with a comfort grip; it's a comfort pen! I honestly didn't know what to expect when I opened the package. The ergo grip is large and I feared it might start to feel slimy to the touch after extended use. My letter writing sessions usually take awhile, I thought perhaps the heat generated by my hand as I write would make the rubber grip feel weird, but much to my delight, it did not. The ergo grip keeps things slip proof, and I noticed immediately that I use way less pressure to write because of the ergo support of the grip allowing me to write longer, with a smooth and easy flow. It's been two months, and aside from all the benefits I've mentioned (less pressure to write, non slip grip, drastic reduction in wrist pain) I am pleasantly surprised that my pen has yet to run out of ink with DAILY use! I have hit this pen hard and it shows absolutely no signs of stopping. Dr. Lee's story behind the development of the pen fascinated me, a little known fact about me (well except to family and close friends) is that I was Pre-Med and aspired to become a Cardiologist. Ƹ̵̡Ӝ̵̨̄Ʒ - Kids Need UGLee, Too! You already know that it takes years of practice learning how to write. Did you know that it also takes years to build up the correct muscles to do so effeciently? Kids are also at risk for repetitive stress injury, in fact that can be where it starts! Because of their underdeveloped muscles, it is easy for children to accumulate small injuries early. Get your children an UGLee Pen and help prevent future hand problems! I am very rough on all my writing instruments (oh my poor chewed pencils!) and I cannot find one negative to report regarding this pen. It's taken numerous falls and the case has not cracked, I have not yet run out of ink, and the ergo grip on this pen is fantastic. It is definitely a 're-buy' in my book, and will replace all my pens in my writing desk. They are also quite reasonably priced, especially in comparison to the benefits it offers! A 3-Pack of UGLee Pens are now only $19.99! WIN IT! - Ascending Butterfly and our friends at UGLee Pen would like to provide one lucky winner with the opportunity to win a set of UGLee Pens! Don't you just ♥ UGLee Pen? How to Win: (1) You must be a PUBLIC follower of Ascending Butterfly to be eligible for this and all giveaways. Indicate in your entry that you follow (if your 'comment name/user id' differs from your profile id, please let me know what name you follow under) and (2) Visit the UGLee Pen FAQ Page and watch any of the videos there, leave the name of the video you watched here! (3) You must also leave your email address somewhere in your comment. (You can format it this way for security, example: ascendingbutterfly AT mail host DOT com, If it is visible in your profile, just say so, that's OK!). Please follow the easy 1, 2, 3 steps to winning! This giveaway is open to USA residents who are 18 years of age or older. Ƹ̵̡Ӝ̵̨̄Ʒ - Enter another giveaway on Ascending Butterfly and earn extra credit, leave a comment letting me know which giveaway you entered. FTC Disclosure Info for this Giveaway: This is not a paid insertion. This is a non-compensated post and all opinions regarding the products are expressly my own experiences. I was provided product to review and the sponsor is also fulfilling product to prize winner(s), this in no way influenced my opinion of my experiences with this product. I watched the "So how did you come to create the Ultimate Grip Pen with such an ergonomic design?" video! I'd love to try these out, my handwriting is awful, I think due to ergonomically bad pens! I'm an UGLee Pens FB fan! Oh I want these pens! I have Fibromyalgia and it hurts like the dickens to write. That's why I spend so much time on the computer! Since I have the fibro I decided I wanted to know about this video: So how well does the UGLee Pen relieve pain? And congrats on being the Blogging Queen! You deserve it! I'm following this time.. I made sure the number changed! I publicly follow your blog via Google Friend Connect-suebabe0704. I watched the video, "So how well does the UGLee Pen relieve pain?" I follow Tracy_Iglesias on Twitter as suebaby05. I follow UGLee pen on Twitter as suebaby05. Following on gfc and watched So how did you come to create the Ultimate Grip Pen with such an ergonomic design? I watched Is the UGLee Pen guaranteed to work for me? Thanks for a awesome giveaway!! These pens are amazing!! Follow UGLee Pen on Facebook told them Ascending Butterfly sent me!! Entered a Linea Pelle Dylan Disco Clutch Designer Bag! Entered Becca Jewel Dust Review & Giveaway! Entered Spring Into Renovation' Giveaway featuring Mythic Paint and Accubrush! I am a follower. I watched "So how did you come to create the Ultimate Grip Pen with such an ergonomic design?" video! I watched the video: So how well does the UGLee Pen relieve pain? Public follower (clynsg) and I watched the So how well does the UGLee Pen relieve pain? video. I'm a facebook fan. ID: Merrie L.
I follow Ascending Butterfly on Networked Blogs. ID: Merrie L.
Follower! I watched 2, where the name came from and what the grip is made of. I checked out So how well does the UGLee Pen relieve pain? I watched the video Why Did you Create the Uglee Pen Anyway? I am following you with Google Friend Connect under this profile. I watched the Why is it called the UGLee pen video. I watched ""Why is it called the UGLee Pen?" With a pen like this maybe my daughter will change her college studies to something harder. I'm a follower and watched the Why is it called an Uglee pen video. I follow Uglee pen on twitter - ncschools. I follow your blog. 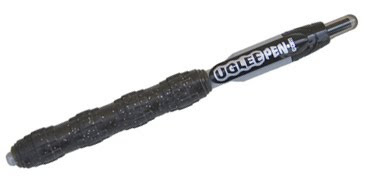 I watched the Why is it called the UGLee Pen? video. I voted for you Fuel My Blog. I follow UGLee Pen on Facebook and let them know you sent me.